The late W. Clyde "Doc" Partin was a beloved Emory University icon for more than 50 years-a teacher, coach, athletics director and historian known for his remarkable contributions to the athletics program. Now that his family has given his personal papers, books and sports memorabilia to Emory's Manuscript, Archives and Rare Book Library (MARBL), he will have a permanent place within the University. Partin's son Clyde Partin Jr., an Emory alumnus, physician and professor who has been a member of the MARBL Literary Collections board for the past 10 years, was instrumental in arranging the gift. He and his mother, Betty Partin, and his two siblings, Keith Partin of Charlotte, N.C., and Betsy Partin Vinson of Gainesville, Fla., are making the gift as a family. Partin said the family has been touched by Emory's welcoming response. "We are incredibly pleased that Emory has shown an interest in preserving the sports collections of my father. He was a keen competitor who was devoted to Emory University, the study of baseball and the history of athletics." The archive includes essays Doc Partin wrote about baseball Hall of Famers such as Babe Ruth, Earle Combs and Frank Robinson, as well as drafts and research notes for those essays. It also includes posters, documents, and baseballs signed by Hank Aaron, Satchel Paige, Buck O'Neil and many other legendary players, along with a substantial collection of books related to African American athletes. These materials will form the nucleus of what the Partin family hopes will evolve into a major collection exploring the role of African Americans in sports and the role of athletics in the struggle for human and civil rights. "Doc Partin had a hand in nearly every major athletic development in Atlanta for years, from the Atlanta Braves to the Olympics," said Randall K. Burkett, curator of MARBL's African American collections. "One of the lesser known but profoundly important aspects of Partin's career was his eagerness to break down barriers to the success of African American athletes in sports at every level." Rick Luce, Emory's vice provost and director of libraries, said the family's gift will strengthen MARBL as a resource for the University and the larger community. "The acquisition of the Partin collection adds a new dimension to our holdings addressing the importance of athletics in our culture generally and in the freedom struggle for racial equality," he said. "We are grateful to Mrs. Betty Partin and her family." The Partin archive also includes extensive records related to the Atlanta Chiefs, the soccer team from the late 1960s that was the brainchild of Partin's close friend Richard A. Cecil, a former executive with the Atlanta Braves. Cecil played a key role in conceiving the idea of a sports archive at Emory. Partin earned a bachelor's degree from Emory in 1950 and a master's in education in 1951. During his tenure as athletics director from 1966 until 1983, Emory athletics saw unprecedented growth that culminated in the construction of the Woodruff P.E. Center, which opened in 1983. He expanded the number of intercollegiate sports, particularly for female students, with women's tennis being added in 1975 followed by women's cross-country and track and field in the early 1980s. Partin also founded the Emory Sports Fitness Camp, now in its 45th year. From 1986 until his retirement in 2002, Partin was a professor of physical education. Over the course of his career, he mentored hundreds of young student athletes. 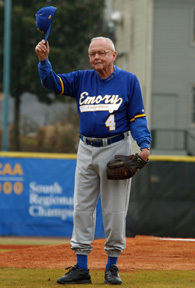 Even after his retirement, he kept an office on campus and often manned the press box, announcing during Emory baseball games. Partin's book on the history of Emory athletics, "Athletics for All: The History of Sports at Emory," was released in 2006. He passed away in June 2009. Betty Partin said the family discovered the treasure trove of materials in the attic of her Decatur home, and she is glad to entrust the archive to Emory. "Clyde loved Emory, he loved his collection, and I think he would like very much to have his work at the Emory library," she said. The Partins' gift is part of Campaign Emory, a $1.6 billion fund-raising endeavor that combines private support and the university's people, places and programs to make a powerful contribution to the world. Investments through Campaign Emory fuel efforts to address fundamental challenges: improving health, gaining ground in science and technology, resolving conflict, harnessing the power of the arts, and educating the heart and mind.